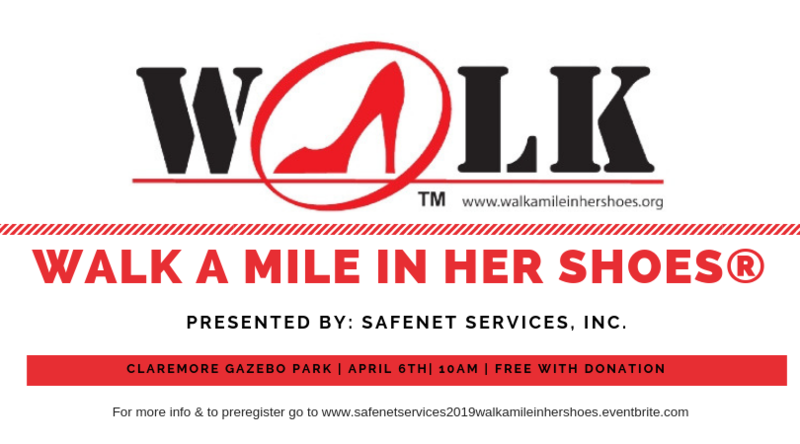 Walk a Mile in Her Shoes® is an award winning, nationwide walk-a-thon in which participants are encouraged to literally walk one mile in women’s shoes. It is a playful opportunity to raise awareness in the community about the serious causes and effects of sexual assault. We will start at CLynn Riggs (Gazebo) Park, have a brief ceremony and walk one mile around downtown Claremore before returning to the gazebo for hotdogs, chips, drinks, and music. THE FIRST 100 TO REGISTER HERE WILL BE GUARANTEED A WALK SHIRT. Participants are encouraged to wear red. Registra­tion for the walk is free and donations are accepted ($15 suggested). Dogs are welcomed and must be on a leash with current immunizations. Team Registration is encouraged! Day of registration begins at 9am. And the Pet Parade & Red Shoe Runway Competition are back! All proceeds benefit Safenet Services, Inc. If you have any questions, please call 918-341-1424 or email Alexandra@SafenetServices.org. To find out more about the nationwide Walk a Mile in her Shoes initiative, visit www.walkamileinhershoes.org.